When you want an aromatic salsa on the table, use this Chile De Arbol. Its flaky and fiercely tasty. Native Mexican, of course, its flavor is very mild, a bit similar to that of the Serrano. But unlike the Serrano, chile de arbol is used mainly in its dried form. The name “chile of a tree,” does not mean that the chile grows on a tree but merely implies that the chile plant is taller than other chile plants. Also called the contracted, “Chile Arbol” all over Texas, it is one of the most commonly used chiles in table salsa and, as you’ll find in the recipe below, has a delicious taste, enticing aroma, and vibrant red color. Some recipes use garlic but I don’t like the result. The sulfur compound, allicin, in garlic has such a strong flavor that it clashes with the mild chile flavor. I do use garlic when I make the fried version of this salsa because the garlic is then rendered less pungent, and the chile develops a “toasty” taste. Use a molcajete. Use a molcajete. Use a molcajete. It bears repeating. You can also use an electric spice grinder, but then you don’t get the volcanic rock sound, the motion and involvement of your body. 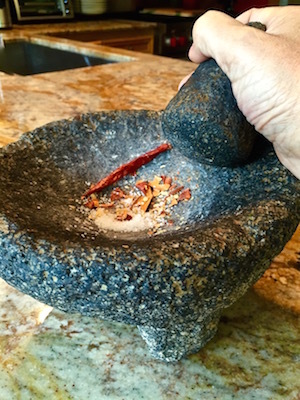 Using a molcajete is the poetic way to make salsa, and here’s a poem about that. 2. Add the tomaotes and smash to your heart’s content, blending all the ingredients. Enjoy! In 3 minutes I made the salsa this morning for a pronto breakfast. Sometimes when you rush to work you have time only to throw some eggs on a skillet, brown some sausage and heat a tortilla. Well, this salsa perks up the morning, and that always faithful flour tortilla makes this speedy breakfast complete and vivifying.